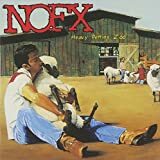 These are lyrics by NOFX that we think are kind of funny. i'm tired of your whining about poor animals dying, and the food they are supplying. cause if a big animal had a chance he wouldn't take a second glance, he would eat you up.